Last year, Columbia Engineering researchers were the first to invent a technology—full-duplex radio integrated circuits (ICs)—that can be implemented in nanoscale CMOS to enable simultaneous transmission and reception at the same frequency in a wireless radio. That system required two antennas, one for the transmitter and one for the receiver. And now the team, led by Electrical Engineering Associate Professor Harish Krishnaswamy, has developed a breakthrough technology that needs only one antenna, thus enabling an even smaller overall system. This is the first time researchers have integrated a non-reciprocal circulator and a full-duplex radio on a nanoscale silicon chip. The circulator research is published online April 15 in Nature Communications and the paper detailing the single-chip full-duplex radio with the circulator and additional echo cancellation was presented at the 2016 IEEE International Solid-State Circuits Conference on February 2. "This technology could revolutionize the field of telecommunications," says Krishnaswamy, director of the Columbia High-Speed and Mm-wave IC (CoSMIC) Lab. "Our circulator is the first to be put on a silicon chip, and we get literally orders of magnitude better performance than prior work. Full-duplex communications, where the transmitter and the receiver operate at the same time and at the same frequency, has become a critical research area and now we've shown that WiFi capacity can be doubled on a nanoscale silicon chip with a single antenna. This has enormous implications for devices like smartphones and tablets." Krishnaswamy's group has been working on silicon radio chips for full duplex communications for several years and became particularly interested in the role of the circulator, a component that enables full-duplex communications where the transmitter and the receiver share the same antenna. In order to do this, the circulator has to "break" Lorentz Reciprocity, a fundamental physical characteristic of most electronic structures that requires electromagnetic waves travel in the same manner in forward and reverse directions. "Reciprocal circuits and systems are quite restrictive because you can't control the signal freely," says PhD student Negar Reiskarimian, who developed the circulator and is lead author of the Nature Communications paper. "We wanted to create a simple and efficient way, using conventional materials, to break Lorentz Reciprocity and build a low-cost nanoscale circulator that would fit on a chip. This could open up the door to all kinds of exciting new applications." The traditional way of breaking Lorentz Reciprocity and building radio-frequency circulators has been to use magnetic materials such as ferrites, which lose reciprocity when an external magnetic field is applied. But these materials are not compatible with silicon chip technology, and ferrite circulators are bulky and expensive. 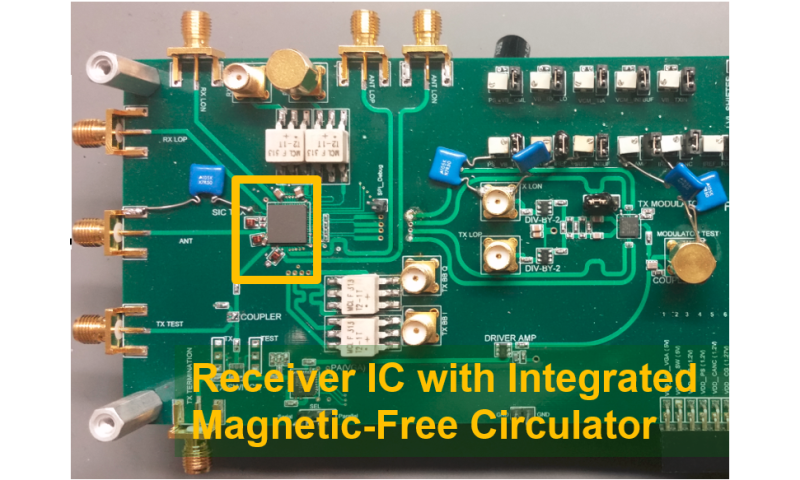 Krishnaswamy and his team were able to design a highly miniaturized circulator that uses switches to rotate the signal across a set of capacitors to emulate the non-reciprocal "twist" of the signal that is seen in ferrite materials. 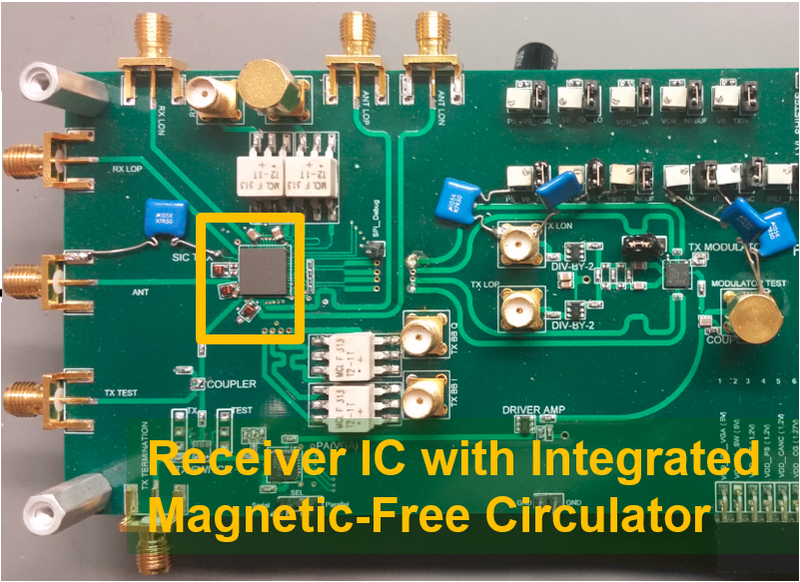 Aside from the circulator, they also built a prototype of their full-duplex system—a silicon IC that included both their circulator and an echo-cancelling receiver—and demonstrated its capability at the 2016 IEEE International Solid- State Circuits Conference this past February. 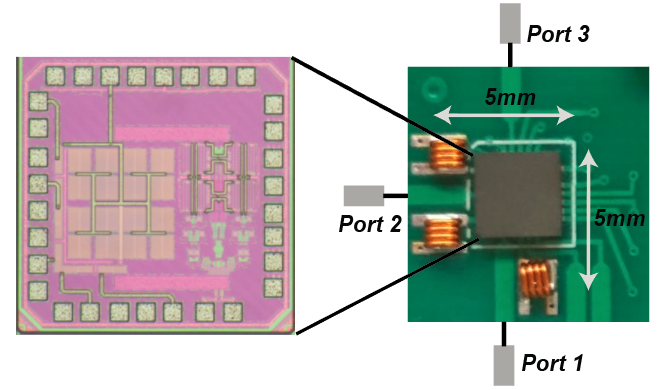 "Being able to put the circulator on the same chip as the rest of the radio has the potential to significantly reduce the size of the system, enhance its performance, and introduce new functionalities critical to full duplex," says PhD student Jin Zhou, who integrated the circulator with the full-duplex receiver that featured additional echo cancellation. Non-reciprocal circuits and components have applications in many different scenarios, from radio-frequency full-duplex communications and radar to building isolators that prevent high-power transmitters from being damaged by back-reflections from the antenna. The ability to break reciprocity also opens up new possibilities in radio-frequency signal processing that are yet to be discovered. Full-duplex communications is of particular interest to researchers because of its potential to double network capacity, compared to half-duplex communications that current cell phones and WiFi radios use. The Krishnaswamy group is already working on further improving the performance of their circulator, and exploring "beyond-circulator" applications of non-reciprocity. "What really excites me about this research is that we were able to make a contribution at a theoretically fundamental level, which led to the publication in Nature Communications, and also able to demonstrate a practical RF circulator integrated with a full-duplex receiver that exhibited a factor of nearly a billion in echo cancellation, making it the first practical full-duplex receiver chip and which led to the publication in the 2016 IEEE ISSCC," Krishnaswamy adds. "It is rare for a single piece of research, or even a research group, to bridge fundamental theoretical contributions with implementations of practical relevance. It is extremely rewarding to supervise graduate students who were able to do that!"